Just goes to show what was lost when Semple left. The next script we'll be discussing on TO THE BATPOLES podcast (probably around the end of May) will be Leonard Stadd's "The Secret of the Impossible Crimes," a script that Semple whole-heartedly rejected in 1965! 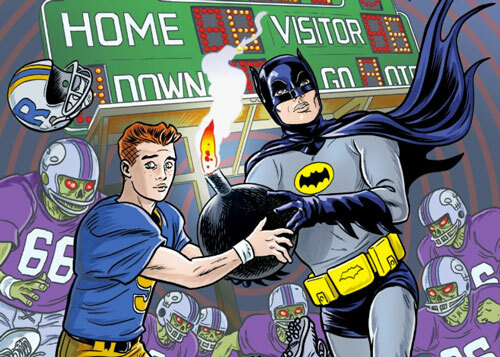 TO THE BATPOLES: We discuss "Archie meets Batman '66", and talk with listener Chris Cavanaugh about his bat-fandom story! Oscar tells us now that those pages are missing from the archive. Yeah, there are several pages missing from the first draft. Wasn't able to get in touch with Laramie in time to see if those pages were accidentally unscanned or simply missing from the archive. As mentioned in the interview! Maybe I should also try going through his sons! Sigh. I have tried to contact him through his university to get him on our podcast, but never got an answer. Guess I'll have to settle for a listen to this instead! December 14?? Seems to have been written before they swapped the Eartha episodes and ran "Catwoman's Dressed to Kill" on that date!